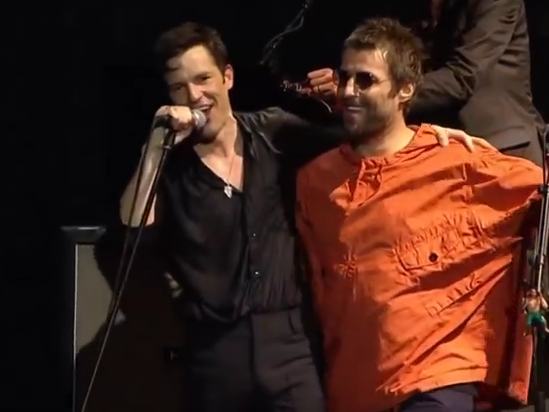 Liam Gallagher swaggered onstage with The Killers during the band's Lollapalooza Brazil set at the weekend. The Las Vegas band headlined the mammoth South American event, plunging into a greatest hits set. During 'All These Things That I've Done' the band received a surprise visitor when Liam Gallagher decided to wander onstage. Tapping Brandon Flowers on the shoulder, The Killers frontman received the fright of his life before realising who was in the bright orange cagoule. Hilarious and a little heart-warming, the two embrace before speaking to the crowd. Curiously, The Killers later threw in an impromptu cover of the Oasis single 'Gas Panic' - a nice nod to the iconic frontman.